Firstly, I don’t yet have a Quora blog myself – or rather, I didn’t until I put this post together (see my fledgling Quora blog here). Secondly, stories about people blogging on Quora – along with successful Quora blogs – are hard to find. 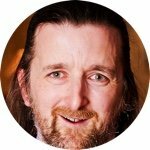 What I found made me realize Quora blogs are one big missed opportunity for additional, quality traffic and online visibility within an engaged community. The results of my investigations into Quora blogs to see just how effective they may be for marketing purposes. Some example Quora blogs, along with some impressive data on the level of visibility and engagement they are achieving. How to create and start your own Quora blog. Some tips on promoting a Quora blog and using it to best effect. Get the checklist with everything you need to start a Quora blog. I’m already familiar with how Quora is turning into a top traffic source for a lot of websites. The majority of their users are college educated (based again on Alexa info – other demographic data is hard to find as Quora don’t collect any), and therefore on average in higher income brackets. Attracting traffic through their profile and bio information, along with (optionally) one or more links provided within answers. (Caution: you have to approach this in the right way). Attracting followers over time, like on other social media networks, and building their profile and visibility on Quora. (See our related post, Quora for Business: The Complete Guide for Business Owners and Marketers). Quora blogs provide an additional opportunity to build the visibility of your business within the thriving, engaged, and often very influential (even Barak Obama answers questions), Quora community. This is part of Quora’s Be Nice, Be Respectful policy. In brief, ensure no post is disparaging or adversarial towards a particular person or group. Within blogs, they define this has an ‘Undisclosed promotion for a link or product‘. In terms of your approach, you should always aim to primarily provide lots of value to the Quora community. So a short paragraph, followed by a link to your main blog post on your own site is unlikely to cut the grade. The primary purpose is to direct traffic elsewhere while providing little or no value on Quora itself. However, a fully fledged piece of content that offers value to the Quora community, with the odd link back to related content on your own site (including a relevant content upgrade) is likely to be fine. Intersperse with links to other content too, just as you would on your own blog. Offer value first and foremost, and you’ll attract more followers and achieve greater results overall. Fairly self explanatory. If you use content from elsewhere, attribute it accordingly. See Quora’s policy on plagiarism and attribution. In short, blogging on Quora is another way to help your business “Be Everywhere” – what this blog is all about, after all. When approached in the right way, it’s also quick and easy to take advantage of. But… How Effective Is It? As a new Quora blog user myself, I can’t report any direct data or personal experience yet. To be clear, this information relates to standard Quora content, i.e. answering questions in the normal way, rather than for Quora blogs. 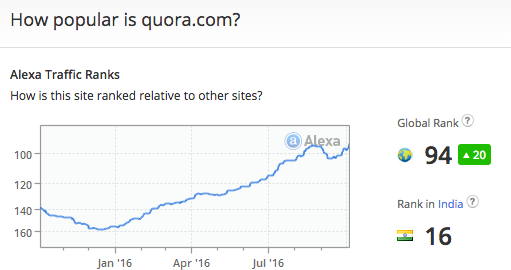 But, if you were going to start an active Quora blog, this data gives some sense of potential scale. (And I show some actual examples of numbers achieved from real Quora blogs below). Writing one great post on Quora will attract a big audience, no matter how many people already know or follow you. Quora have over 300,000 different topics, under which all content is categorized. 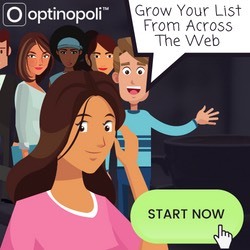 Each of these topics attract followers, whether hundreds, thousands, or hundreds of thousands of people. By publishing your Quora blog post to one or more different topics, your content is exposed to these followers, as well as others looking at those topics. For example, by selecting relevant topics for this type of post on Quora, its potential reach is over 600,000 followers. (It’s unclear whether this figure involves some overlap, i.e. with people following related topics). Photography: nearly 4 million followers. Cooking: over 4 million followers. Digital marketing: nearly 250,000 followers (this could potentially be included above, bringing the total closer to a million. It’s unclear how these follower numbers would translate into viewing figures for posts under these topics. And whether factors such as the time of day you post makes any difference. I look forward to finding out. But, potentially at least, Quora blogs appear to offer another powerful content platform on which to build visibility for your business and reach a targeted audience. See below for some actual data for active Quora blogs. There are a couple of potential drawbacks to be aware of. It might seem an obvious point to make, but the majority of Quora’s traffic is of course focused on questions, and answers to those questions. That’s what Quora users are used to and have come to expect from the site. Potentially at least, they are therefore more likely to click through on question/answer content, than blog content. So, your Quora blog content may not have the same level of visibility or attract the same level of engagement as your answers to questions on Quora might do. This is something I need to find out more about as I start publishing on a Quora blog myself. (See below for information on setting your own Quora blog up). The robots.txt file that Quora creates when your blog is created blocks search engines from indexing your content. So don’t expect your posts on Quora to show up on Google or on other search engines. (Your answers will still show up fine of course). However, while this blocks off one source of potential traffic for your posts, it is just one source of traffic after all, and shouldn’t stop you from blogging on Quora. People following the topics you have published the post under. In other words, they’ll see it in their Quora feed on the home page. People who are searching for something related to your post on Quora, through Quora’s own search facility. People looking directly at a particular topic. People following you and/or your blog on Quora. In other words, you’ll still get a ton of exposure. And I’ve got some Quora blogs to share with you below, so you can see what this means in practice. The lack of search indexing also gives you an advantage of sorts. It means you won’t lose anything by simply copying across and publishing content you may have already repurposed for say LinkedIn Pulse or Medium. That makes it easier and quicker to use a Quora blog. In other words, presuming you are already repurposing content for other channels to build your online exposure, you’re only talking a few minutes of extra work at most to copy across to a Quora blog too. It’s also a task that can be easily and cheaply outsourced or otherwise handed off to someone on your team. So simply add the same content to Quora that you have elsewhere, and enjoy all the benefits. So What Actually Happens In Practice? As with other social sites, content platforms, and blogging in general, what you get out tends to be what you put in. The more content you publish and the more active you are, the more followers you’ll attract, the more engagement you’ll build, and the more advantages you’ll enjoy over all. The good news with Quora blogs is that the time commitment appears to be relatively minimal, presuming you already have the content available from elsewhere. To be honest, I don’t yet know for definite. As a complete Quora blogging newbie I can’t speak from personal experience. But, on studying other Quora blogs in order to try to answer this question for myself, the numbers involved certainly made me sit up and take notice. Perhaps you will too. This Quora blog for SaaS founders and executives has nearly 2,500 followers at the time of writing, and has attracted over 550 views [5 upvotes, 0 comments, 0 shares] so far for a post written around three weeks ago. A post from four months ago has over a thousand views [3 upvotes, 1 comment, 0 shares]. And from six months ago, over four and a half thousand views [29 upvotes, 1 comment, 2 shares]. Over 500 views [2 upvotes, 0 comments, 0 shares] for a post from three weeks ago. Over 900 views [2 upvotes, 0 comments, 0 shares] for one a couple months back. One with over 1,500 views [2 upvotes, 0 comments, 0 shares] from eight months ago, and several in between with several hundred to a thousand plus views. Most posts published over the past twelve months or so have several hundred to a thousand plus views, and similar levels of engagement. The most recent post from May 2015 has nearly 30,000 views [70 upvotes, 1 comment, 0 shares]. Another from several months prior to that (and posted to Medium at the same time) attracted over 20,000 [100 upvotes, 3 comments, 0 shares]. Other posts attracted from around 5,000 to 20,000 views on average, and varying levels of other engagement. No, it’s not just for wierd technical or business-related blogs. You might think Quora a strange place for a photography blog, but that works here too with this regularly published blog from professional photographer Diana Cretu that has so far attracted nearly 3,000 followers. Her posts attract dozens of upvotes and hundreds of views within just a few days, thousands within a few weeks. In terms of other engagement indicators, she typically attracts dozens of upvotes, numerous comments (higher than I’ve seen on other Quora blogs), and a handful of shares. In case you think this is a one off, here’s another blog on photography and astronomy, attracting hundreds to thousands of views per post, and with over 500 followers so far. Similarly, other engagement stats seem higher than for blogs on other topics. With over 4 million followers of the photography topic on Quora, it’s perhaps not too surprising that photography blogs appear to do well on the platform. 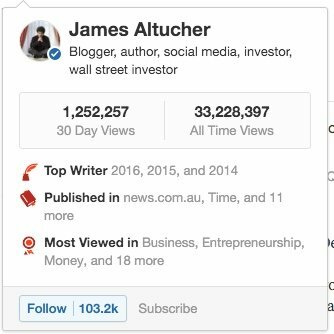 Prolific blogger, author, and social media influencer James Altucher (@jaltucher) regularly writes on a variety of topics on his Quora blog. With nearly 8,000 followers, his posts regularly attract thousands of views, sometimes tens of thousands. He also attracts real engagement, with higher levels of upvotes, comments and shares than I’ve seen for other Quora blogs. Did I mention he’s also been a Top Writer on Quora for the past three years, has over 100,000 followers, and has over 30,000,000 views to his answers on Quora? This is how authority and influence is done. Some may find it easy to fall into the, “It’s alright for him…”-type mindset; easy to forget he simply (or not so simply) did what it takes to get where he is; easy to dismiss the real message and move on. It’s sobering to realize that in 2002, he was unknown and his life was a wreck. The more value you provide in the post, the more views and other types of engagement it attracts. Short, snippet type posts don’t do nearly so well. Most posts attract at least several hundred views. By publishing regularly, for example, once a week or more, a Quora blog would generally attract thousands of views a month. Just as with other social networks, visuals tend to do well. They make content easier to engage with, and appear to attract more upvotes and shares. Some posts from two or three years ago (like this one) now have 10,000+ views, some a little less, and others a lot fewer. One from @OliverEmberton has over 170,000 from just 18 months ago, though odd he’s not published here since, nor on his own blog for well over a year. However he seems kind of busy over at silktide, which perhaps speaks volumes. In fact, the more I have studied Quora blogs – mainly in the course of creating this post – they appear to be a vastly under-used resource for additional traffic (and building authority and credibility) that very few people seem to be aware of or using. So, with all this apparent potential to help your business get noticed by your target market, how do you actually set up a Quora blog and start to use it? 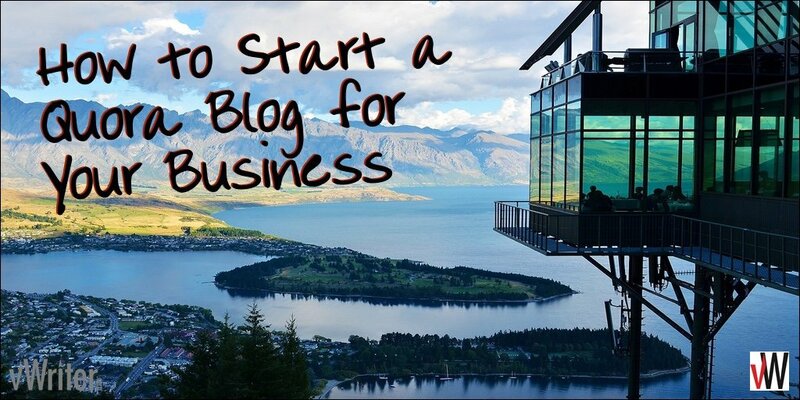 The process of starting a blog is very straightforward. Click to Create a Blog as shown. This will allow you to set up a blog at e.g. http://keywords.quora.com. Enter in the name of your blog, your chosen URL, and a description. Don’t be salesy or try to drive traffic to your commercial websites. This is about attracting followers to your blog and providing them with valuable content. So indicate the type of value you intend to provide through your blog. Try linking to a couple other social sites where people can connect with you further. I’ll probably add an image within this too at some point. Copied across info from content I’d published on LinkedIn Pulse previously (including a header image). Selected what I hoped were the most relevant topics. It took less than five minutes to do. Note that in creating posts, you’re able to save drafts and so return to it later. Plus, Quora automatically saves your content as a draft as you go along. After creating your blog and adding your first post, you can also then add an icon image for your blog and help to build its visibility and overall appeal. 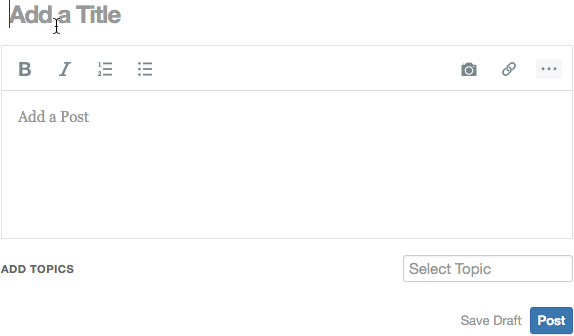 Note that Quora uses the icon within a circular shape. So obviously I’ve only just started with a Quora blog. It will be interesting to see how it develops over time, and I’ll update this post accordingly in due course. Add links to anywhere you wish, including linking words and phrases (all links are nofollow) – URLs are automatically linked in the usual Quora fashion. Add as many images as you like. Mention a Quora user, topic or question – use the @ icon. Add block quotes – you should always use this format if you’re quoting someone, and provide attribution in line with Quora’s policy. Headings – all your text will be one size. Ability to center text and other content. It’s all left-aligned. Add more spacings between paragraphs. Multiple line breaks are automatically replaced with just a single line break. You’ll also notice the interface is very plain. You can’t add content in the sidebar, or otherwise change the appearance of your blog. 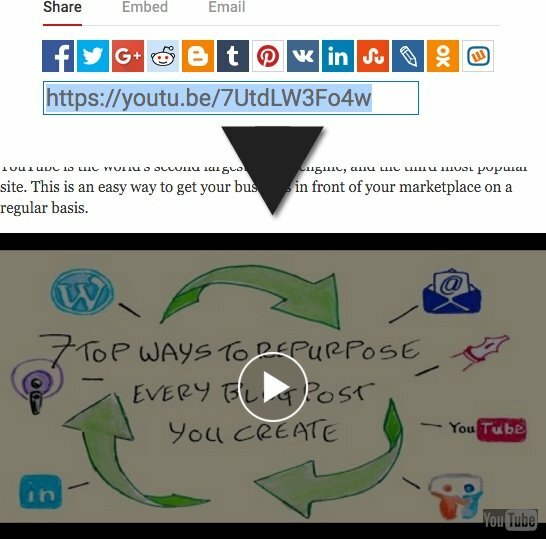 You can also embed videos by simply pasting in the Share link from YouTube. Don’t worry if you don’t get much traffic or other engagement at first. 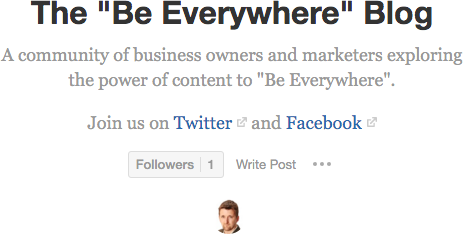 Few if any Quora users will start following you when you’ve only published a post or two. As with any other blogging or social media activity, give it chance to build over time. Refer to posts you’ve created on Quora from questions you are answering. 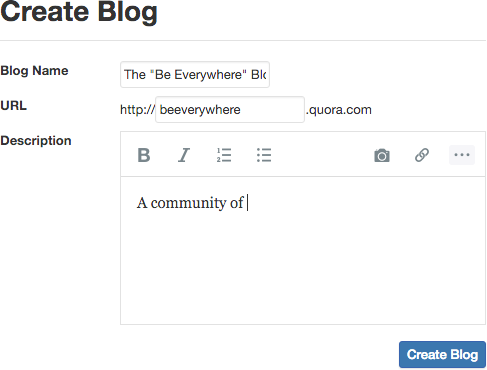 Add a post here to introduce your blog to the Quora community. It’s the one place you’ll find you can freely promote it on Quora. I’ll do this too once I’ve published more content on it and it looks, well, a bit more lively! Use your social channels to both introduce your blog, and link to the content you are creating on it. Publish regularly and consistently. Preferably, do so systematically so it’s a regular process within your business. Outsource and delegate it to ensure it gets done. The more content you create and produce, the more attractive it will be for people to follow it, and the more opportunities you’ll have to promote it elsewhere. 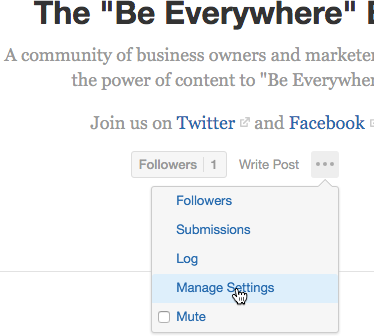 Link through to your posts on Quora from content elsewhere – on your blog, on LinkedIn (e.g. from the Publications section in your profile and from articles on Pulse), from content you create on Medium, and so on. 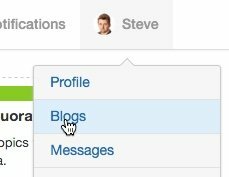 Add a link to your blog to signatures in emails, including any regular emails you send to your list. Get the checklist with everything you start a Quora blog. What you shouldn’t do with your Quora blog is take the Hey, come buy my stuff approach. That’s spammy, won’t attract views and engagement, and will probably get you thrown off – or at least a first warning. First and foremost, provide value to the Quora community through your content. 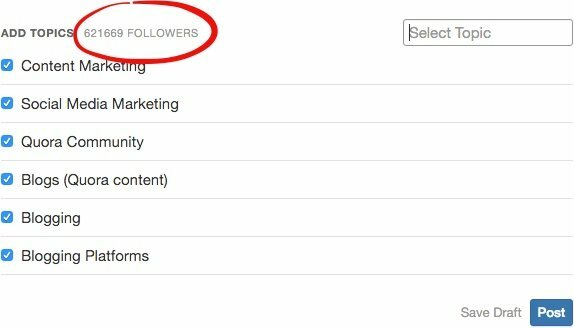 This is how you’ll attract followers, upvotes, and extend the reach of your content on Quora over time. Blog posts on your own site. Incorporate opt-in mechanisms within this content such as content upgrades to attract quality leads from Quora. Content you have elsewhere, such as Medium, SlideShare, Pulse, and so on. Again, incorporate content upgrades and other opportunities for viewers to join your list. Link to your social channels – for example, invite readers to get more of your content via Twitter, Facebook and so on via a note at the end of your posts. As I’ve shown here, the potential with Quora blogs is obvious. I see just as much marketing opportunity here as on other content platforms such as Medium and LinkedIn Pulse, if not more so. And yet very few people – very few business owners and marketers – are using the content platform to help reach their marketplace. That seems to me a missed opportunity. So I’ll be using the platform over the next few weeks and months, and testing it out for myself. The key, as with other social sites, would seem to be to allow it to build over time. Persistence and patience in regularly posting content to the platform, if the other Quora blogs I’ve looked at are anything to go by, are likely to pay off in the end. There seems a huge amount to gain, and, as it only takes a few minutes each time to post some new content, relatively pain free to take advantage. Remember to get the checklist with everything you need to start a Quora blog to refer back to. I have been using Quora seriously for 4 months now and it can be a great traffic source. As you point out though the Blog feature does need some thought to get it to attract any traffic. The moderators actively block any attempts to promote the blog in your answers and you need to embed links in your content but you really need to be careful as you can get banned for spamming yourself. The moderation is draconian and once you start to get a large number of views it gets their attention, as soon as I hit over 1 million views I started to get problems with answers being collapsed and deleted for no apparent reason. However all the effort is starting to pay of and I am getting some high quality conversions for affiliate links. Am going to stick with it for a while longer but ultimately expect to get barred, so Q dump my content regularly so I can easily jump ship. Thanks for the great summary and information. Hi Steve, thanks for sharing your experiences of using Quora, that’s really interesting. If you find linking back to your blog within your Quora answers is leading to problems, would recommend simply continuing to promote it, but off the Quora platform (e.g. in your own blog and other content). Would never recommend solely relying on a Quora blog (and I’m not saying that’s what you’re doing here), but simply repurposing content to Quora from elsewhere to take advantage of all the additional traffic it can attract for you. In other words, it should be one channel out of many. I have only recently come across Quora and am investigating blogging. Thank you for the great information. It is a lot to take in at once but I have it saved so I can go back and reread. Not even aware of the Quora Blog … Thanks for highlighting it. Will definitely use it as another medium of traffic.